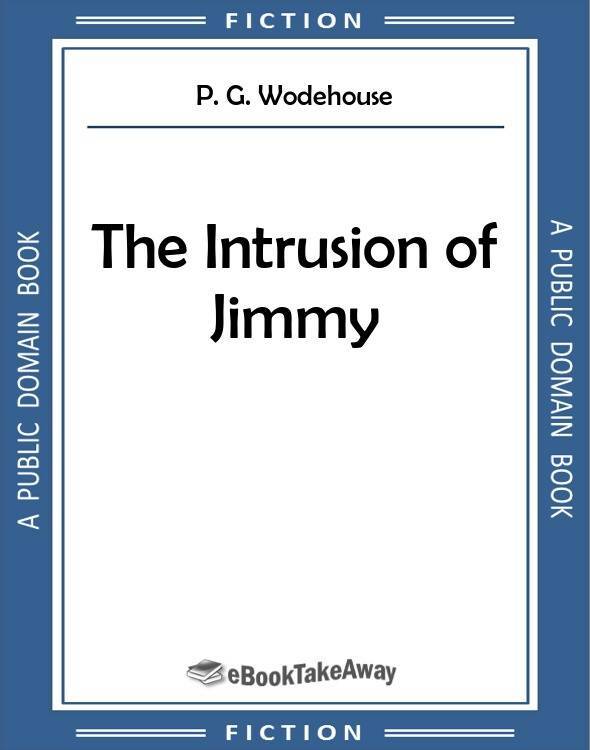 Download The Intrusion of Jimmy by P.G. Wodehouse for iPhone, iPad, Nook, Android, and Kindle in PDF and all popular eBook reader formats (AZW3, EPUB, MOBI). The main smoking-room of the Strollers' Club had been filling for the last half-hour, and was now nearly full. In many ways, the Strollers', though not the most magnificent, is the pleasantest club in New York. Its ideals are comfort without pomp; and it is given over after eleven o'clock at night mainly to the Stage. Everybody is young, clean-shaven, and full of conversation: and the conversation strikes a purely professional note. Everybody in the room on this July night had come from the theater. Most of those present had been acting, but a certain number had been to the opening performance of the latest better-than-Raffles play. There had been something of a boom that season in dramas whose heroes appealed to the public more pleasantly across the footlights than they might have done in real life. In the play that had opened to-night, Arthur Mifflin, an exemplary young man off the stage, had been warmly applauded for a series of actions which, performed anywhere except in the theater, would certainly have debarred him from remaining a member of the Strollers' or any other club. In faultless evening dress, with a debonair smile on his face, he had broken open a safe, stolen bonds and jewelry to a large amount, and escaped without a blush of shame via the window. He had foiled a detective through four acts, and held up a band of pursuers with a revolver. A large audience had intimated complete approval throughout. "It's a hit all right," said somebody through the smoke. "These near-'Raffles' plays always are," grumbled Willett, who played bluff fathers in musical comedy. "A few years ago, they would have been scared to death of putting on a show with a crook as hero. Now, it seems to me the public doesn't want anything else. Not that they know what they DO want," he concluded, mournfully. "The Belle of Boulogne," in which Willett sustained the role of Cyrus K. Higgs, a Chicago millionaire, was slowly fading away on a diet of paper, and this possibly prejudiced him. Raikes, the character actor, changed the subject. If Willett once got started on the wrongs of the ill-fated "Belle," general conversation would become impossible. Willett, denouncing the stupidity of the public, as purely a monologue artiste. "I saw Jimmy Pitt at the show," said Raikes. Everybody displayed interest. "Jimmy Pitt? When did he come back? I thought he was in Italy." "He came on the Lusitania, I suppose. She docked this morning." "Jimmy Pitt?" said Sutton, of the Majestic Theater. "How long has he been away? Last I saw of him was at the opening of 'The Outsider' at the Astor. That's a couple of months ago." "He's been traveling in Europe, I believe," said Raikes. "Lucky beggar to be able to. I wish I could." Sutton knocked the ash off his cigar. "I envy Jimmy," he said. "I don't know anyone I'd rather be. He's got much more money than any man except a professional 'plute' has any right to. He's as strong as an ox. I shouldn't say he'd ever had anything worse than measles in his life. He's got no relations. And he isn't married."